[S815] Newspaper - Otago Daily Times, issue of 12 Sep 1873, Birth Notices, p2. [S189] International Genealogical Index (IGI), Entry on film 1760829. [S542] Index - New Zealand BDMs online, at http://www.bdmhistoricalrecords.dia.govt.nz/, Birth Reg. No. 1873/7531. [S542] Index - New Zealand BDMs online, at http://www.bdmhistoricalrecords.dia.govt.nz/, Death Reg. No. 1879/3098, aged 5. [S420] Dunedin City Cemeteries database, at http://www.dunedin.govt.nz/facilities/cemeteries/…, Original reference N18790519; Block 1 plot 8. [S236] CD - Dr Williams Library & County Civil records, British Vital Records CDs, FHL film 1041383. Dorothea Ellen MOSELEY was born in Michigan circa 1890. [S443] CD - NZ Marriages, CD - NZ Marriages 1836-1956 V2, NZ Registrar General's Folio 10155. [S542] Index - New Zealand BDMs online, at http://www.bdmhistoricalrecords.dia.govt.nz/, Marriage Reg. No. 1924/7580. [S542] Index - New Zealand BDMs online, at http://www.bdmhistoricalrecords.dia.govt.nz/, Death Reg. No. 1958/24363, aged 67. [S750] Southland District Council Cemetery database, at http://www.southlanddc.govt.nz/my-southland/cemeteries-/…, Block III B, Plot 9. Elizabeth died before 1861 in Kent as her husband Robert was a widower in the 1861 census. 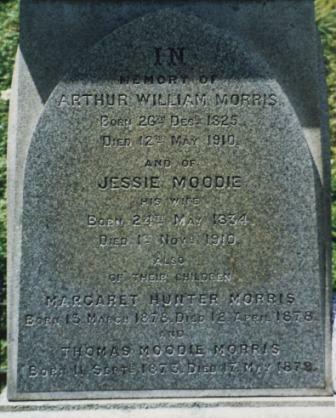 Leslie Arnold MOULDER was born circa 1900. [S443] CD - NZ Marriages, CD - NZ Marriages 1836-1956 V2, Folio 8911. [S542] Index - New Zealand BDMs online, at http://www.bdmhistoricalrecords.dia.govt.nz/, Death Reg. No. 1956/28672, aged 56. [S542] Index - New Zealand BDMs online, at http://www.bdmhistoricalrecords.dia.govt.nz/, Marriage Reg. No. 1914/5469. [S542] Index - New Zealand BDMs online, at http://www.bdmhistoricalrecords.dia.govt.nz/, Birth Reg. No. 1870/13671, son of Thomas and Mary. [S800] National Archives - NZ Archives (Archway), Item ID R6695249, Agency BBAE, Series 4985, Accession A48, Box 58, Record D208/1928. [S542] Index - New Zealand BDMs online, at http://www.bdmhistoricalrecords.dia.govt.nz/, Death Reg. No. 1952/21079, aged 81. Thomas MUDIE was born in Scotland circa 1776. Thomas died before 1851 in Scotland as his wife was a widow in the 1851 census. [S917] GRO Scotland, marriage record, Parish of Monikie, OPR Marriages, GRO 311/00 0030 0332. [S117] Census - 6 Jun 1841, UK census, Scottish GRO 465/00 005/00 033. [S612] GRO Scotland, birth/bapt record, District of Murroes, OPR Births/baptisms, GRO 313/0010 0145. She was widowed on the death of her husband Alexander before 1854. She was widowed on the death of her husband Alexander before 1881. [S917] GRO Scotland, marriage record, Parish of St Cuthberts, OPR Marriages, GRO 685/02 0420 0423 FR1170. [S468] Family Tree - Daniel A Cooper, "Family Trees - McGregors by Cooper" , See Note 51. [S117] Census - 6 Jun 1841, UK census, Scottish GRO 685/01 050/00 005. [S917] GRO Scotland, marriage record, Parish of Leith South, OPR Marriages, GRO 692/02 0260 0140 FR6770. [S340] Census - 7 Apr 1861, UK census, Scottish GRO 685/02 051/00 011. [S367] Census - 2 Apr 1871, UK census, ED 29 RG10-5396 Folio 25 p4 GSU roll 849483. [S116] Census - 3 Apr 1881, UK Census, ED 4 RG11-5276 Folio 148 p66 FHL film 1342269. [S612] GRO Scotland, birth/bapt record, Parish of St Cuthbert's, OPR Births/baptisms, GRO 685/02 0035 FR2273. [S871] FamilySearch, at https://familysearch.org/, FHL film 889481, Ref 2:18NVDBC, Scotland, Select Births and Baptisms, 1564-1950. [S542] Index - New Zealand BDMs online, at http://www.bdmhistoricalrecords.dia.govt.nz/, Death Reg. No. 2018/4764 gives this birthdate. [S542] Index - New Zealand BDMs online, at http://www.bdmhistoricalrecords.dia.govt.nz/, Death Reg. No. 2018/4764. [S1170] Newspaper - Waikato Times, issue of 17 Feb 2018, Deaths.